It’s been more than a year since this blog was posted to. 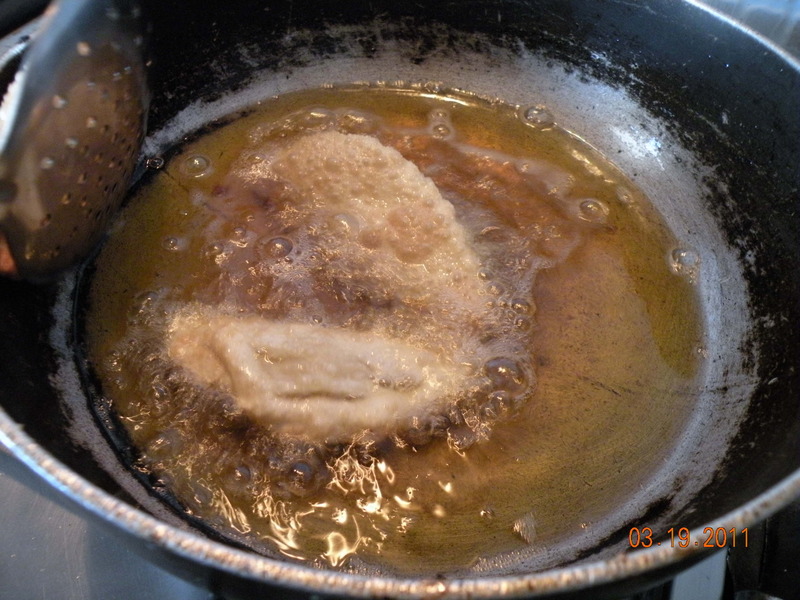 In the interim, the cooking, trying out new recipes, eating and drinking continued unbroken, but somehow I never got around to blogging about it. Maybe the first flush of enthusiasm from the initial months of this blog last year had faded somewhat. I’m told many blogs face this fate. And so a year and a bit went by. Saturday, 14 April was Bengali new year’s day (or Poila Boishakh). And a day before that was Vishu, the Malayali new year, and Tamil New year’s day. And Baisakhi in Punjab, and Bihu in Assam. It seemed like a mighty fine time to get Foodnama going again. Hopefully this time around, the infatuation would have given way to something more steady, less ephemeral, and the output on the blog will reflect that. On Poila Boishakh as I wolfed down sweets through the day and later went out for dinner with the family I was reminded of an article I’d read a few months back. Mihir Sharma had written in the Indian Express that Indian festivals lacked distinctive foods to go with them, unlike the turkeys at Thanksgiving, or the cakes at Christmas. I wasn’t entirely convinced then. I believe the range and diversity of occasions in our festivals make it unlikely that they would necessarily have typical foods associated with them. Also, some of our biggest festivals have underpinnings other than food – think Diwali and Holi for example. Secondly, festivals that do have foods associated with them are sometimes the minor or lesser known festivals, that are not nationally known. 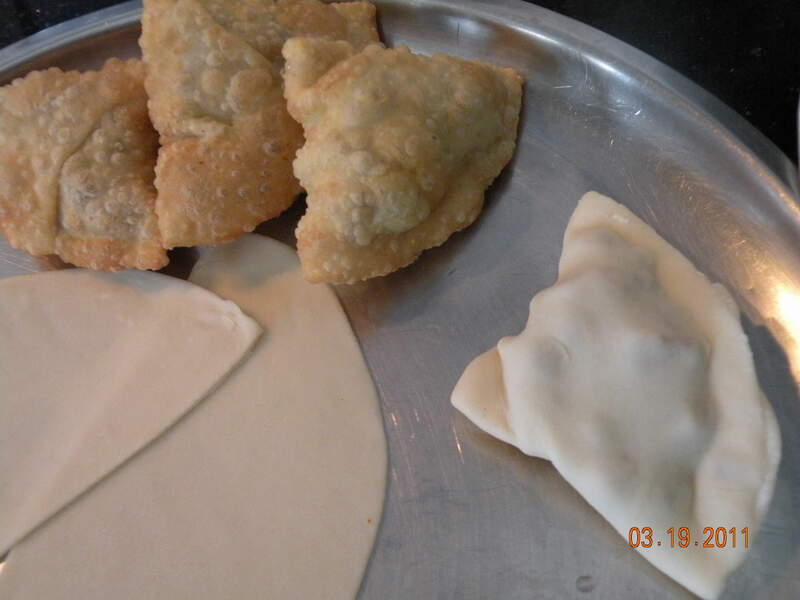 Poush Sankranti (also known as Makar Sankranti) is a Bengali event that readily comes to mind. 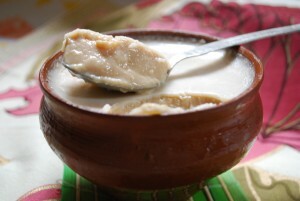 ‘Puli-pithey’, a range of outstanding sweets that are traditionally home-made and not often sold by merchants of Bengali sweets, are integral to Poush Sankranti. I would also posit that Durga Puja (not exactly a minor festival anyway) is typified by the glory of Calcutta street food, certainly in celebrations outside Bengal. I cannot think of too many other examples right away, however (Ignorance is the main culprit, and enlightenment in this area is certainly a cause worth pursuing). As a result I’m not sure if Mihir’s point is the more correct one and Poush Sankranti is the outlier, or we simply do not know of enough festivals that go with specific kinds of festive foods. 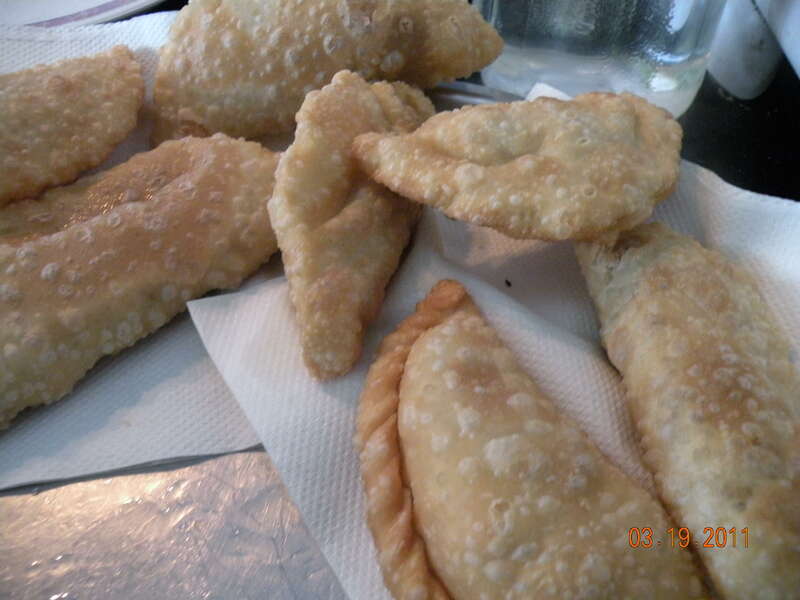 It may also well be that festival foods are gradually fading away, unable to command the attention and time to recipes and traditions from people today. And that would the sadder thing surely, than not to have foods linked to festivals to begin with. 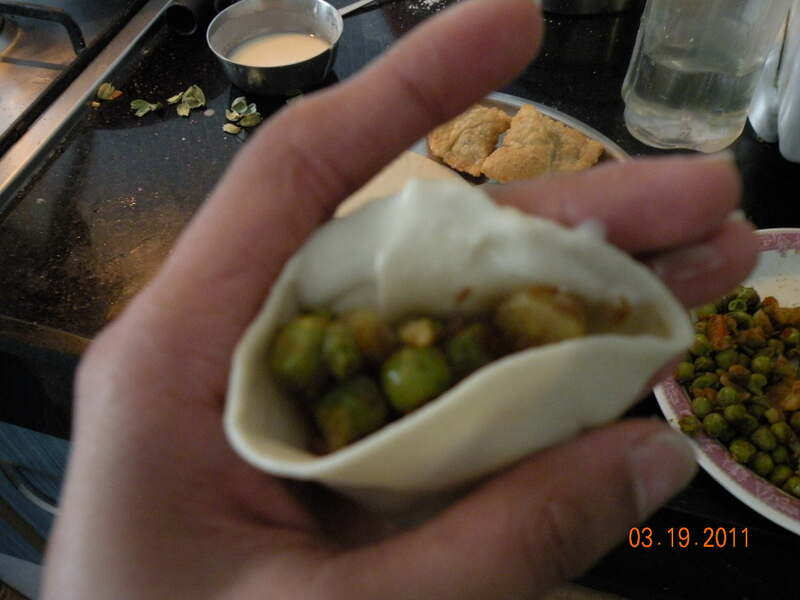 I have already conquered the gujiyas… and very close on its heels (like the same day)…. 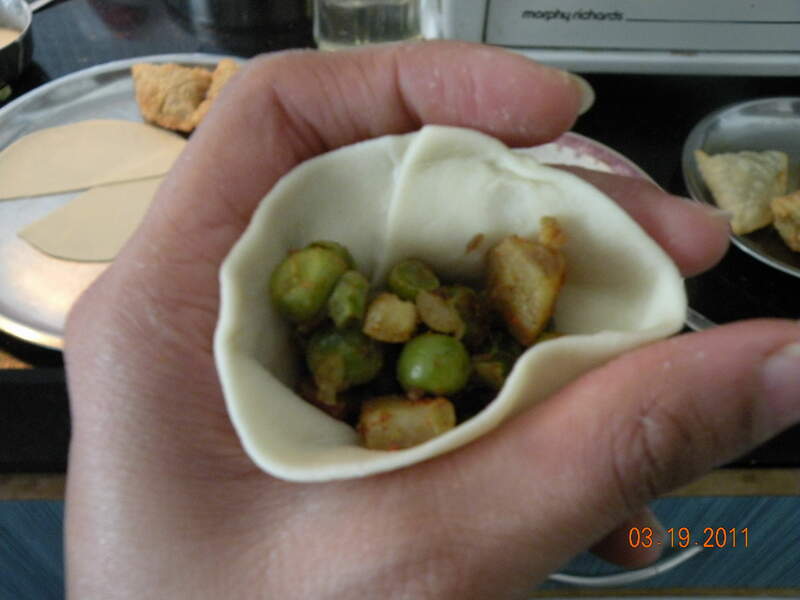 was the mighty Samosa!!! So here’s the dope on that…. 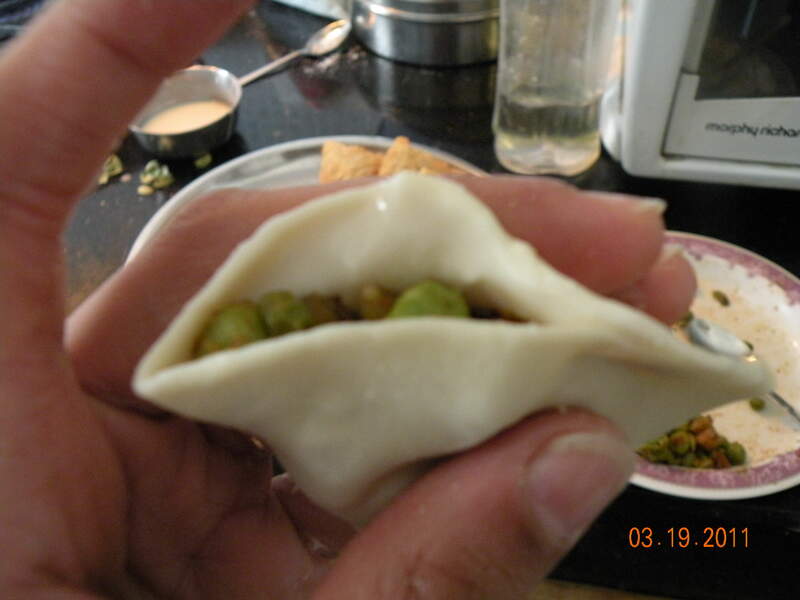 Filling: We made VEG peas and potato filling. 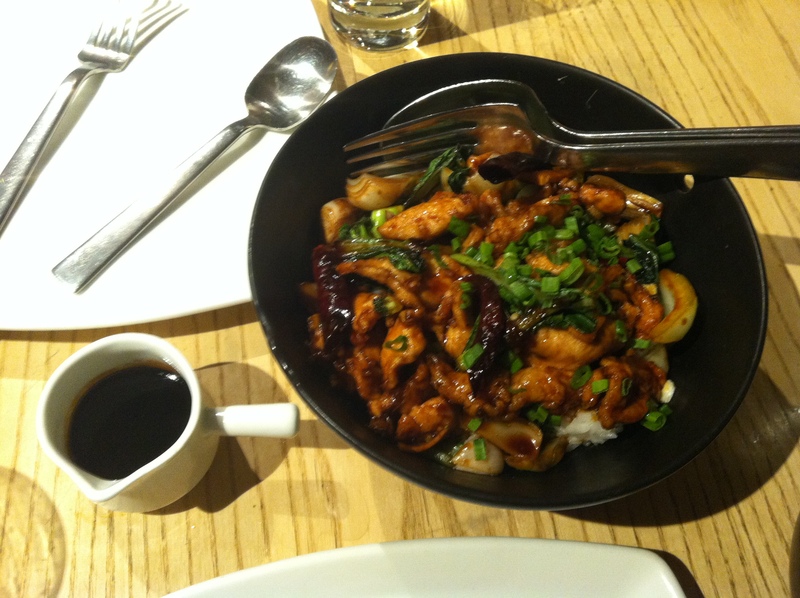 Very simple, non-spicy so kids could also have it. But I’ll tell you some alternatives. 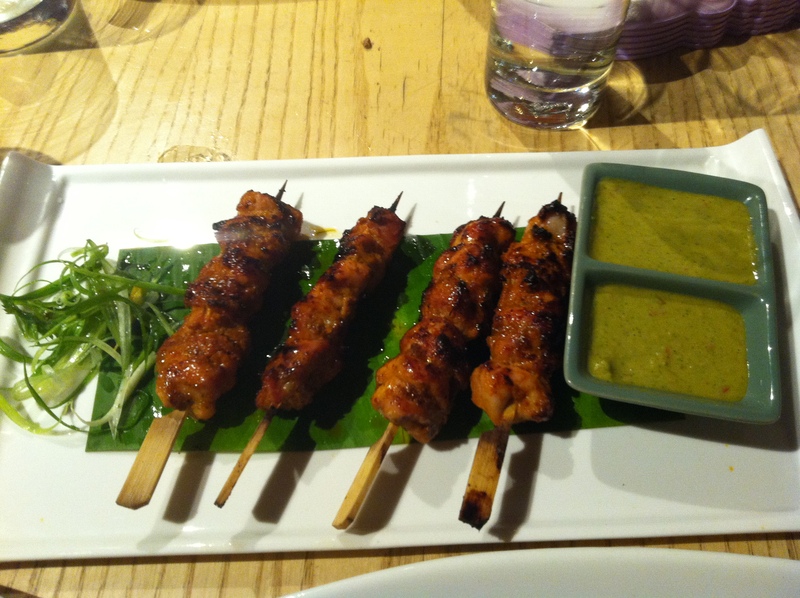 Masalas we used: Salt, garam masala, jeera powder. 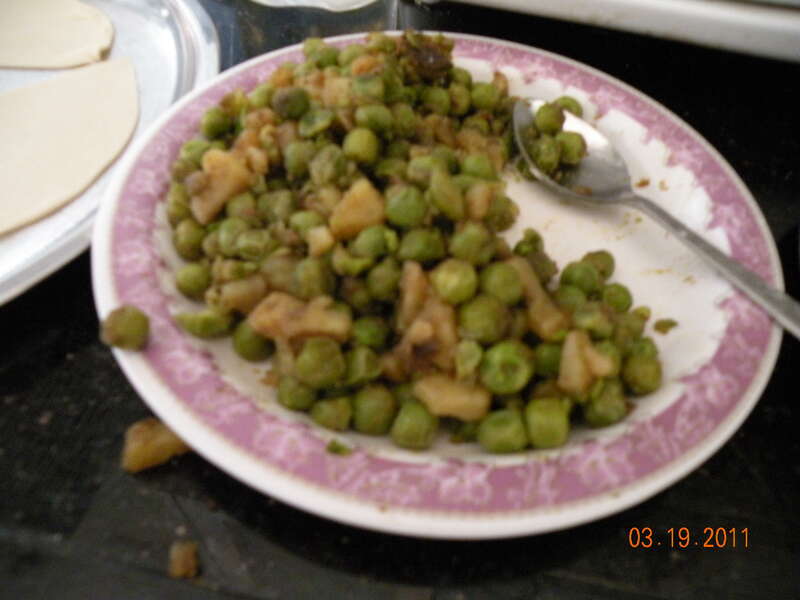 Use a little oil and put the masalas, add the peas and diced potatoes (small pieces), stir around till light brown. The cover and cook till the veges are done. If there’s any water/ moisture, heat till its dry. Step 1: Roll out into a round shape. Cut into 2 halves. 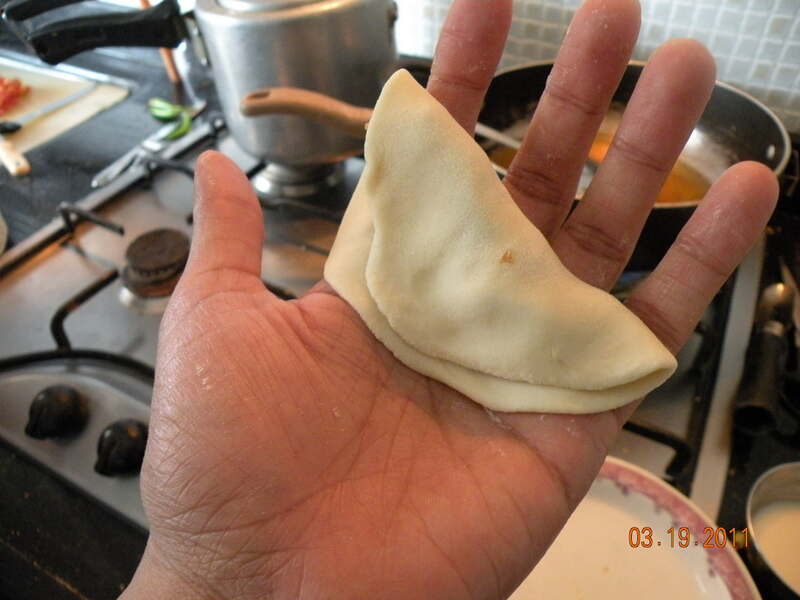 One half for each Samosa. Step 2: Need to make a cone shape. 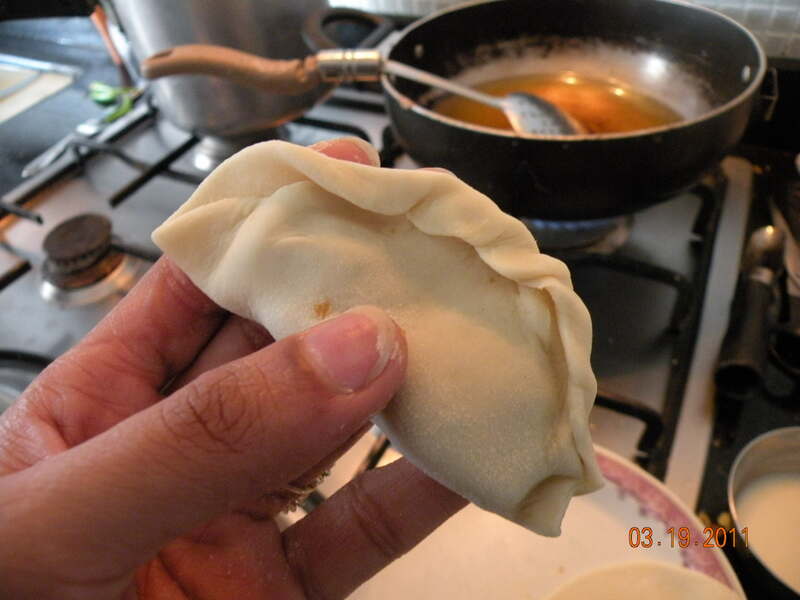 Use your hands to hold it open to stuff the filling in. P.S. 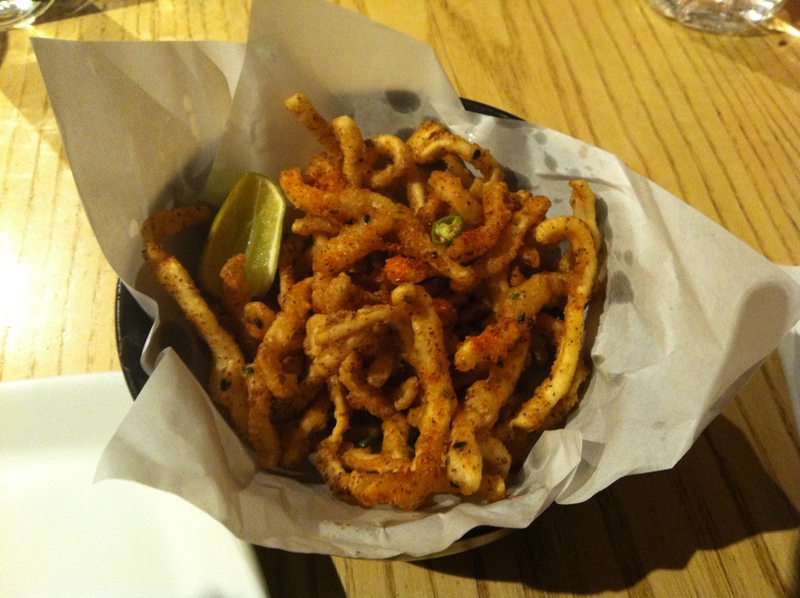 : Alternatives – For better taste, add finely chopped coriander, grated ginger and finely chopped green chillies. Also a good Non-veg option is mutton keema and peas. You’ll have to pressure cook and dry the filling. 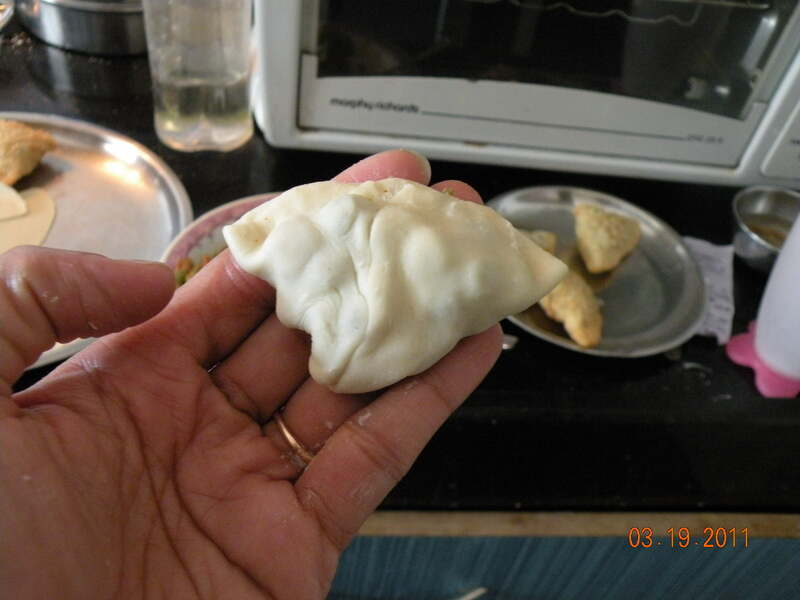 So this Holi I tried Gujiyas at home… with Mom, and maid’s help of course… I was a bit scared to try it on my own… Mom gathered up the initial enthu!! Well… to my surprise it quite easy !! (Funny how that comes to you when you have been avoiding it for years)!! So I thought I should pass on my newfound wisdom, and easy recipe, of course. For the filling this is what we did: dry roast (keep aside), add 100 gms khoya to kadhai with some ghee and stir till it turns light brown, then add dry fruits, stir a bit more. Add 1 or 2 tbsp sugar till it melts and becomes soft, and lastly grated desiccated coconut about 2-3 tbsp. Add the suji also at this time. Now everyone doesn’t like the coconut flavour, so choose accordingly. You can up the Suji content if you are not putting coconut. 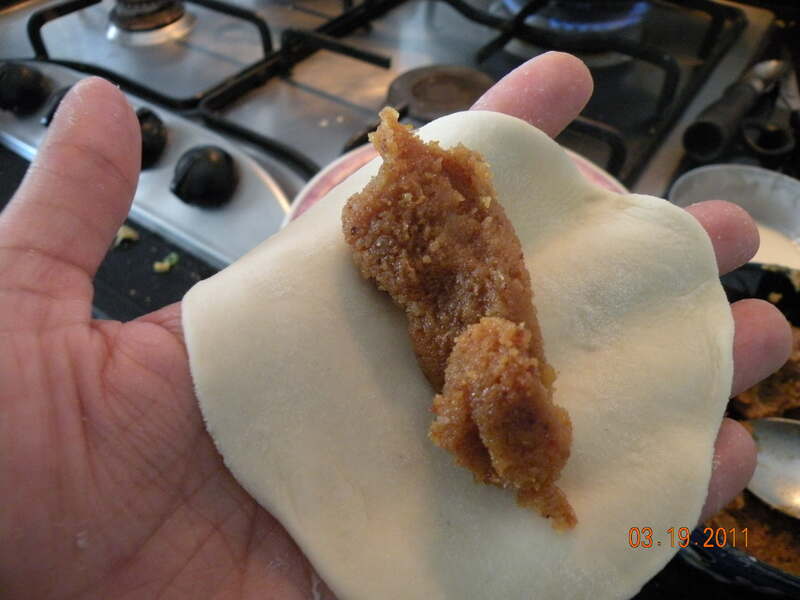 The consistency should be a bit crumbly and a bit powdery in places. For the dough: Maida kneaded with oil/ghee. First rub the ghee/oil through the maida till its crumbly. Then add a bit more till it holds in your palm when you close it tight. 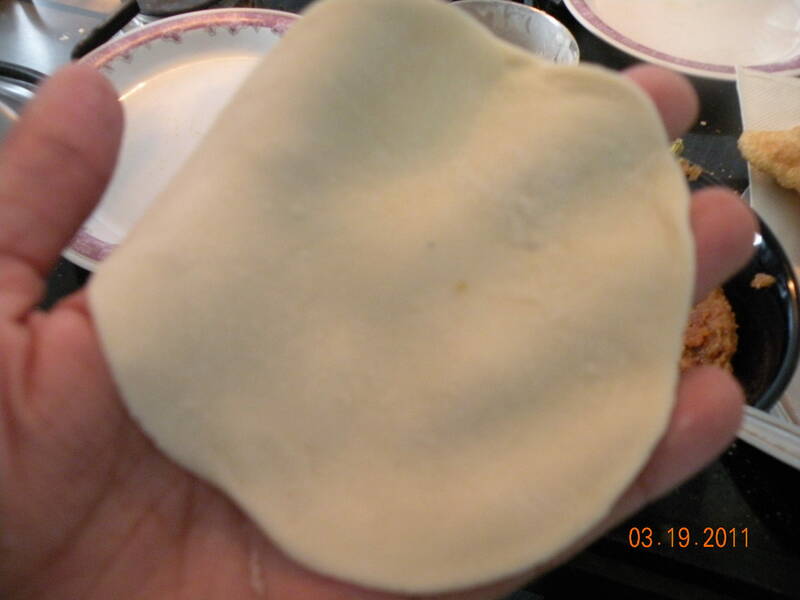 Add just a bit more water to make a soft dough and comes out clean from the vessel. 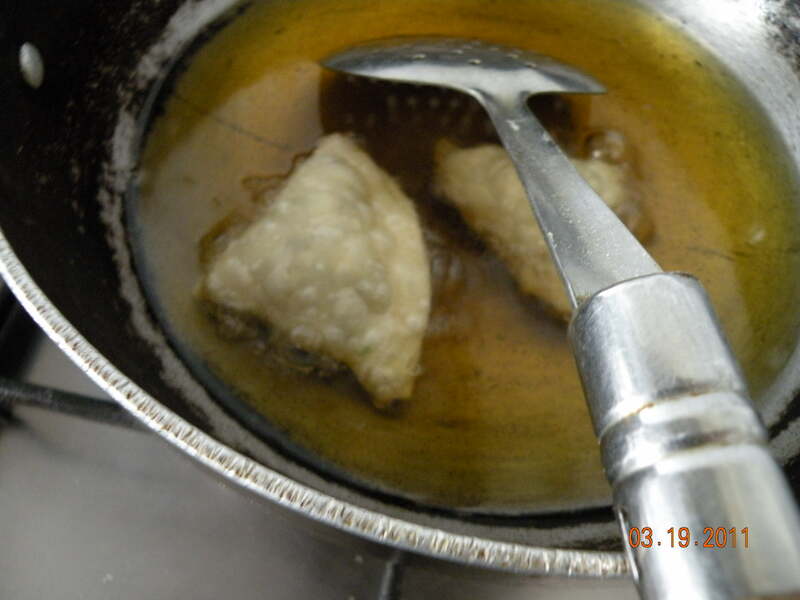 If its sticky, just a hint of more oil/ghee should do the trick. 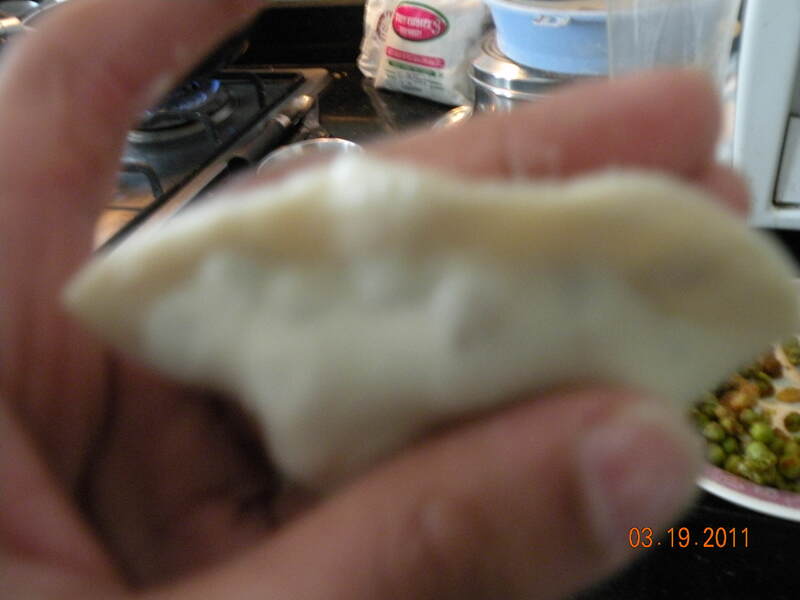 For sticking the ends together: Just prepare a little mix of maida and water. 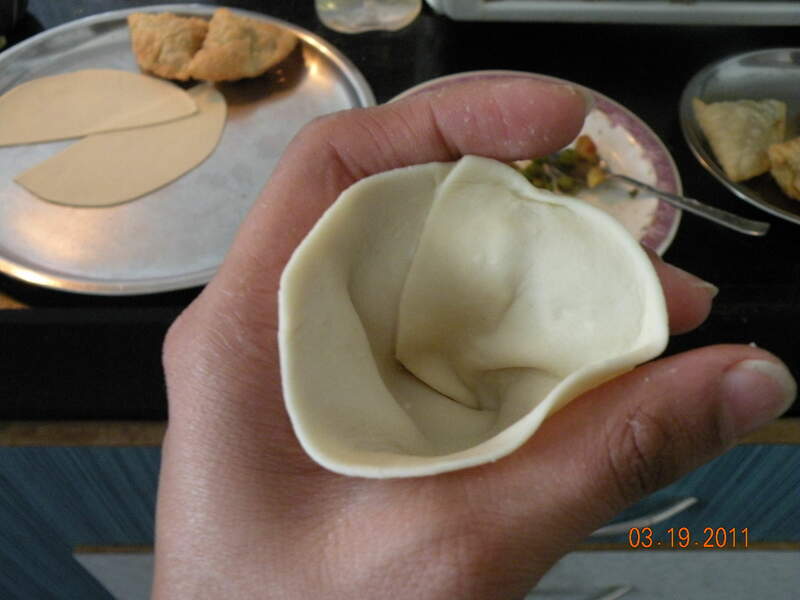 Maida doesn’t dissolve, so you’ll have to stir it with your fingers each time you are trying to use that as ‘glue’ to stick the ends of your gujiya together. 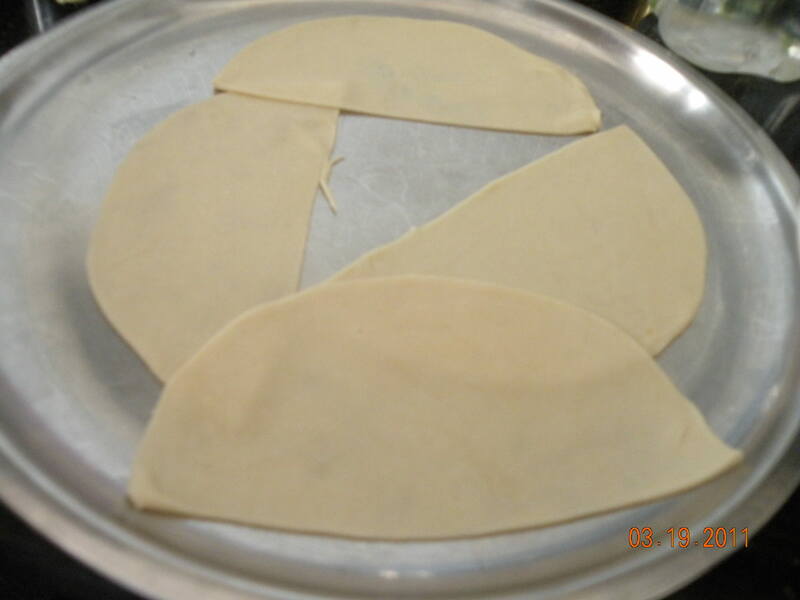 Step 1: Roll out the dough in small round shapes. Take it on your palm. 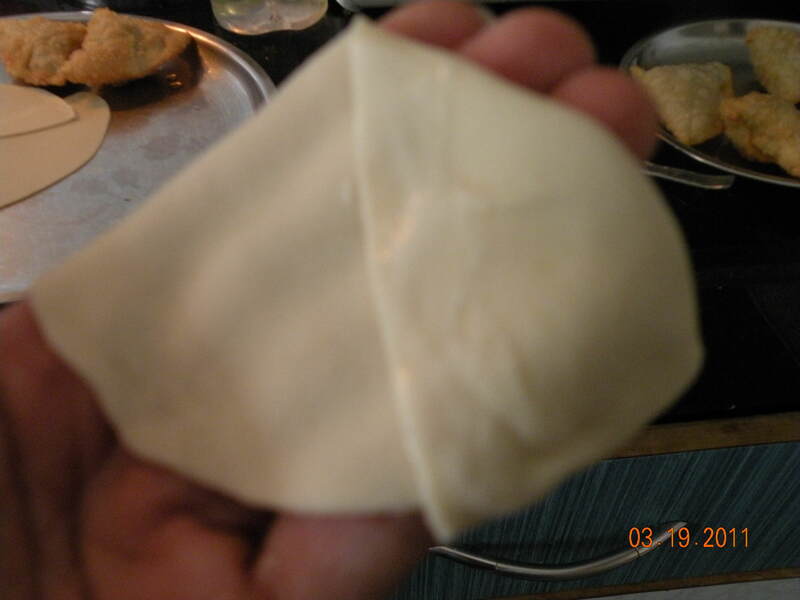 Step 2: Add enough filling to ensure you can fold over the filling into a semi-circular shapes, but still leave enough space around the edges to stick the edges.